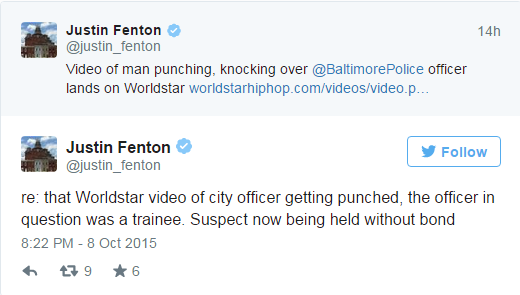 Two officers in Baltimore tried speaking with a man on the street when he became belligerent. The black man was shirtless and posturing. The officer in charge was a white female. She had a black officer who was a trainee with her. When the suspect would not produce ID and started getting confrontational, things got real. He kept telling the female cop to stop touching him. Eventually, they tried to handcuff the man and wrestled with him. He got loose and punched the trainee in the head, knocking him out cold. Thankfully, before the guy could get the officer’s gun, he came to and continued to help the female officer. The guy was wrestled to the ground and cuffed in front of a growing crowd of onlookers who did nothing but video and chat while it went down. 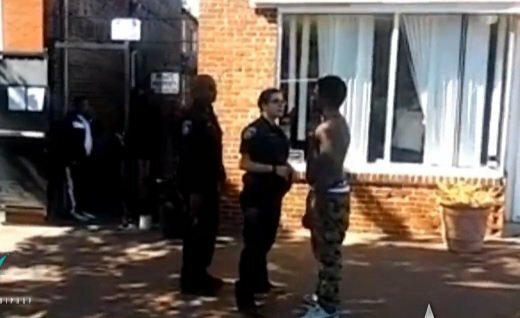 Two Baltimore police officers were attacked by a man while trying to talk to him on a residential city street, according to a video posted to World Star Hip Hop on Thursday. The video shows two uniformed officers, a Black man (a trainee) and a white woman, attempting to talk to a young shirtless Black man. The man keeps telling the officers not to touch him. A crowd of onlookers is gathered around on the sidewalk at a distance while others can be seen looking out from ground floor rowhouse windows, doors and an alley gate. After a minute or so of this the confrontation escalates as the officers decide to take the man in to custody. The man violently resists, struggling against both officers and then eventually squaring off against the female officer. The male officer attempts to intercede and is dropped by one punch to the head by the suspect. Someone off camera warns the suspect is trying to take the unconscious officer’s weapon. The officer quickly comes to and helps the female officer as she tries to handcuff the suspect. All three end up wrestling on the sidewalk. At no point did the officers use any weapons on the man, nor did they appear to draw their guns on him. Apparently Baltimore police officers are expected to take a beating rather than risk hurting an attacker and setting off another riot. Justin Fenton of the Baltimore Sun posted on Twitter the attacker’s name, James Young, and the numerous charges he is being held on without bond. The officers did not use any weapons on the man, although he certainly was asking for it. 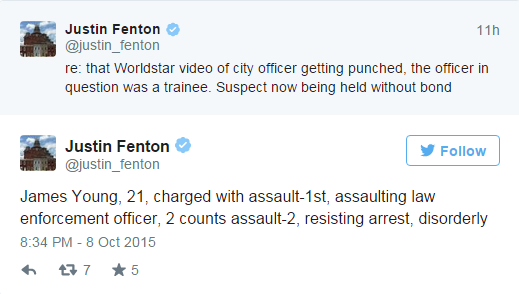 I guess they have been warned to take a beating rather than risk another incident there like Ferguson. James Young, the attacker, is being held on multiple charges of assault and resisting arrest. I’ll bet he’ll be out in no time. When other officers arrived on the scene, Young tried to act like he was just down and not resisting. The video tells a different story. He is being held without bond, which is at least something. These thugs think they can now treat the police however they want and that they have nothing to fear. This is why crime is spiraling out of control in Baltimore now. I don’t envy these officers. Their jobs just got a whole lot tougher due to the Feds, racists and cop-haters. Thankfully, no one got seriously hurt here. One wonders if that guy had succeeded and gotten the officer’s weapon, then killed one of them, if they would have cheered. I wouldn’t bet against it. VIDEO WARNING: VIOLENCE AND PROFANITY.